The natural disaster has also revealed some of the fundamental weaknesses of a dysfunctional system that, having devoted its principal resources and much of its energies to promoting a weird ideology, seems to be incapable of coping with basic tasks of a normal nation-state. President Hassan Rouhani, spending a week-long holiday in the island resort of Qishm, appeared beyond reach. "Supreme Guide" Ali Khamenei, too busy with a poetry gathering, was unavailable for days and found it unnecessary even to comment. Iranians watched in amazement as special units of the regular army moved to save lives, prevent floods from spreading further, reopen roads and even start repairing some of the damage. Buoyed by the presence of regular army units, thousands of volunteers also poured in to help deal with the disaster. Contacts across Iran describe the solidarity shown by average citizens as "exemplary", implying that Iran deserves a better government. It may take weeks if not months before the full facts of the current nationwide floods in Iran are established. But we already know that the floods represent one of the biggest natural disasters Iran has suffered in half a century. 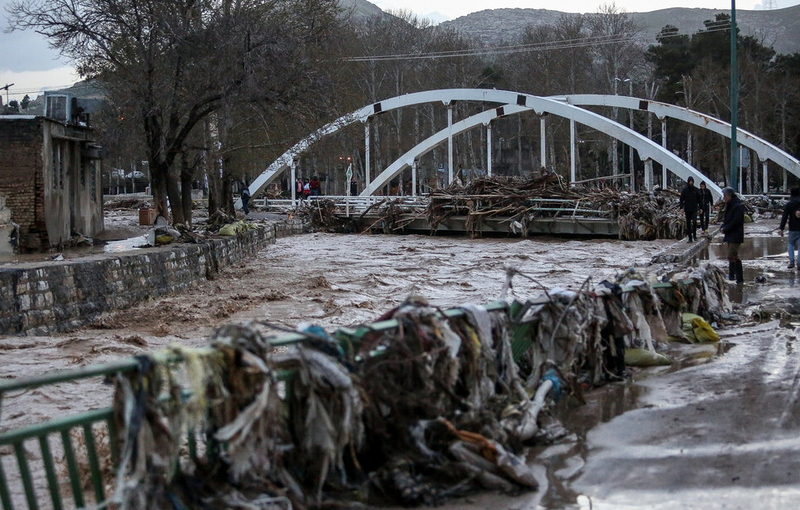 According to provisional data from the Islamic Red Crescent, the floods struck in over 300 towns and cities in 22 of Iran's 31 provinces, affecting 18.5 million people, almost a quarter of the nation's total population. Some 1.2 million people have been made homeless, at least temporarily. The damage done to infrastructure across the nation is equally massive. With 141 rivers in flood and some 500 landslides over 3,000 kilometers of roads and highways connecting thousands of villages, 78 medium or large cities have been partly or totally destroyed. Also destroyed are 87 bridges, 160 dams and over 1,000 kilometers of railway lines. The floods have put over 18,000 factories and workshops out of action while the damage done to farming is described as "incalculable." From a broader point of view perhaps, the natural disaster has also revealed some of the fundamental weaknesses of a dysfunctional system that, having devoted its principal resources and much of its energies to promoting a weird ideology, seems to be incapable of coping with basic tasks of a normal nation-state. It took the parallel authorities that coexist in Tehran more than 48 hours before they realized what was going on, giving the state-controlled media the green light to report on it. Then it took another two days before the various duplicating organs of the state, decided who was supposed to do what. President Hassan Rouhani, spending a week-long holiday in the island resort of Qishm, appeared beyond reach. "Supreme Guide" Ali Khamenei, too busy with a poetry gathering, was unavailable for days and found it unnecessary even to comment. The Islamic Revolutionary Guard Corps (IRGC), often boasting about its imaginary conquests in Iraq, Syria, Lebanon and Yemen and promising to hoist the flag of Khomeinism in Washington, was forced to intervene -- not to save the stricken citizens but to protect some of the infrastructures it has built and runs as businesses. It was soon revealed that those infrastructures, including railway lines built in traditional flood channels and dams hastily erected in wrong places and wrong rivers, massively contributed to the floods. The IRGC has built over 300 crude dams to divert waters of various rivers to land it had seized and transferred to active and/or retired officers. In a strategy that recalls that of the Chavistas in Venezuela, the IRGC has also helped many peasants, seen as part of the regime's support base, to cut down large tracts of forests, further raising the risk of floods. More than a week after the disaster had struck, Rouhani, using thinly veiled words, put the blame on the IRGC's cowboy-style "social" building projects and profiteering schemes. IRGC chief General Muhammad-Ali Aziz-Jaafari riposted by accusing Rouhani's cabinet of incompetence and poor leadership. The failure of the official government led by Rouhani and the unofficial one led by Gen. Jaafari, both under Khamenei's ultimate control, at least theoretically, provided a space for other actors to jump in. The first to do so was the national army which, since the mullahs seized power in 1979, has been treated as a Cinderella in boots. The IRGC reacted by ferrying in dozens of "Madaheen", professional reciters of religious chants whose patron is Khamenei. The "Madaheen" jumped into flood waters chanting "Suffering makes us strong!" and "We are not afraid of death" while beating their chests the way they do when they mourn the martyr Imam Hussein at Muharram. In some places they were accompanied by women who attend Muharram mourning sessions as "tear-shedding assistants." The parallel governments also spent time debating whether or not to appeal for outside assistance. While the official foreign ministry awaited instructions regarding contact with the International Red Cross and other aid agencies, the unofficial foreign ministry, located in Khamenei's office, decided that "those who know how to mourn Hussein" need not humiliate themselves by shaking a begging bowl at "Cross-Worshippers and Zionists." In the Bam earthquake in 2003, over 60 countries rushed to help Iran cope with the disaster. The façade government at the time, led by President Muhammad Khatami, had welcomed foreign aid. That had angered the "Supreme Guide". "How could we humiliate Islam in the face of the Infidel?" Khamenei had demanded. This time, however, the façade government, headed by the hapless Rouhani, dared not defy the "Supreme Guide". Rouhani's First Assistant, Eshaq Jahangiri, had this to say: "A country as rich as the Islamic Republic has no need of foreign assistance." However, to fool his American apologists, Muhammad Javad Zarif, the man who plays the role of foreign minister, still had to blame the United States for lack of any foreign assistance or even sympathy. "American sanctions prevent help from reaching Iran," Zarif's spokesman said last Monday. However, everyone knows that humanitarian aid as well as food and medicine and other items of trade with no probable military use are not covered by the US, the European Union and the United Nations sanctions. In any case there is no sanction against a foreign leader, our dear friend President Vladimir Putin for example, phoning someone in Tehran to express condolences and sympathy. The problem is that Putin wouldn't know whom to phone in Tehran: Rouhani the mullah, who plays as president, or Khamenei, who may feel insulted if he is told there has been a catastrophe in his "Islamic" paradise?